A lot of my research over the last years has been on organic agriculture, examining the potential contribution of organic agriculture to global sustainable food security by looking at agronomic (yields), ecological (biodiversity), social (farmer livelihood) and policy (organic regulations) dimensions. Check out my full PhD thesis here. In this study we examined the relative performance of organic agriculture across a whole suite of agronomic, environmental and socioeconomic indicators. This study was published in Science Advances in 2017 ​(see full list of publications here). ​​In this project we examined how the yields of organic agriculture compare to conventional agriculture through a global meta-analysis of the literature. This study was published in Nature in 2012 (see full list of publications here). What distinguishes organic agriculture from concepts like agroecology, low-input agriculture or conservation agriculture is that organic agriculture is the only management system that is regulated in laws in most countries. In order to understand what organic agriculture means today we carried out a content analysis of different organic regulations from across the world. From this analysis we concluded that regulations define organic mostly in terms of 'natural' vs. 'synthetic' inputs. Environmental best practices are, instead, not well represented in organic regulations. This project was carried out in collaboration with Navin Ramankutty (UBC) and Tabea Mayerhofer (TU München). This study was published in Food Policy in 2017 (see full list of publications here). ​We know that organic management typically increases biodiversity within fields and within farms. But how does this effect of organic management depend on landscape context? In this project - in collaboration with my supervisor Navin Ramankutty (UBC), with Andrea J. Reid (Carleton University ), Sylvia L. Wood (Bioversity International, Columbia University), Daniel Haberman (McGill University), Jeanine Rhemtulla (UBC), Andy Gonzalez (McGill University), Tim Benton (University of Leeds) and Doreen Gabriel (Julius-Kühn Institute) - we examine how landscape composition and landscape configuration influence the biodiversity benefit of organic management through a meta-analysis of the scientific literature. ​​For organic agriculture to be a viable alternative to conventional farming it needs to be able to provide livelihoods to farmers. So what are the benefits and problem of organic management for farmers? I wrote a policy brief based on a literature review on the livelihood outcomes of organic management for the Institute for the Study of International Development (ISID, McGill, see full list of publications here). I also conducted a case study on organic farmer livelihoods in the South Indian state of Kerala in 2013, conducting interviews with organic and conventional farmers as well as key informants involved in organic agriculture. The Kerala case study was carried out in collaboration with my supervisor Navin Ramankutty (UBC), as well as Stephanie Austin, Sarah Turner and Madhav Badami (McGill University). ​During my postdoctoral research at the University of British Columbia I am working on developing a global classification of farming systems across the world using new datasets on global agricultural management that we developed within the EarthStat project. 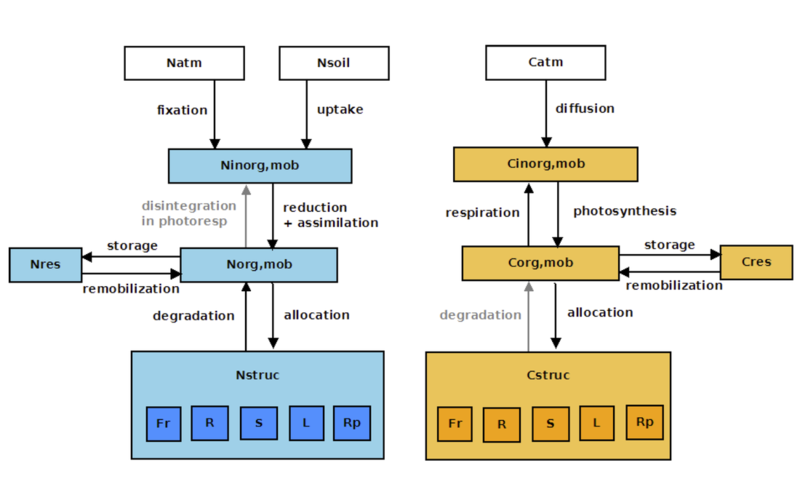 ​During my diploma thesis at the University of Würzburg and under the supervision of Christoph Müller (Potsdam Institute of Climate Impact Research, PIK), Wolfgang Cramer (PIK) and Werner Kaiser (Department of Botany I, University of Würzburg), I examined the influence of nitrogen limitation on crop photosynthesis in order to develop a modelling framework that allows including nitrogen controls on crop production in global models of the terrestrial land surface. See my full diploma thesis here. In this project I examined the secondary seed dispersal of seeds spat and dropped by Sykes monkeys in the South African Soutpansberg range using camera trapping. This project was in collaboration with Birthe Heikamp and Frauke Fischer (Department of Animal Ecology and Tropical Biology, University of Würzburg). This study was published in 2009 in the African Journal of Ecology (see full list of publications here).